Here is the list of the hotels near Coulanges-lès-Nevers. Book your hotel near Coulanges-lès-Nevers today, Wednesday 15 May for the best price, reservation and cancellation free of charge thanks to our partner Booking.com, leader in on-line hotels reservation. Below here is the list the 50 closest hotels of Coulanges-lès-Nevers, sortable according your criteria. You will find the position of these accommodations on the Coulanges-les-Nevers hotels map. Featuring free WiFi, Flammarion Résidence offers accommodation in Nevers. Ducal Palace of Nevers is 1.6 km from the property. All units have a dining area and a seating area with a flat-screen TV. There is also a kitchen, equipped with an oven and microwave. A fridge and stovetop are also available, as well as a coffee machine. Towels and bed linen are offered. Nevers Cathedral is 1.7 km from Flammarion Résidence. Au Relais Nivernais is situated on the east side of Nevers, 2 km from the Cathedral and from the train station. It offers air-conditioned rooms with free Wi-Fi access and a garden with a terrace. Each room includes a flat-screen TV and a private bathroom with a shower. Continental breakfast is served daily and you can enjoy traditional French cuisine at the restaurant. Access to the A77 motorway is a 5-minute drive from the Relais Nivernais. The property provides free private parking on site. Guest accommodation Nevers Preferred hotel ! Zenao Appart'Hotel offers self-catering accommodation located in the centre of Nevers, just 2.5 km from Nevers Train Station. With free WiFi, it offers a terrace and a games room as well as a TV lounge. Each apartment comes with a balcony or terrace, a bathroom with shower and a seating area with flat-screen TV. The private bathroom is complete with a shower and free toiletries. You can prepare meals in the kitchenette, which is equipped with a microwave, stovetop and a refrigerator. Shops and restaurants can be found within walking distance of the property. The property offers free private parking on site, and it is located a 20-minute drive from Magny-Cours Race Circuit. Nevers Cathedral is only 1.6 km from the aparthotel. Located in the centre of Nevers, this former post office offers a children’s playground, a private garden and a terrace with sunbeds. Free WiFi is provided. All the soundproofed rooms at Chambre d’Hôtes des Ducs feature a desk, a wardrobe and a flat-screen TV with cable channels. A private bathroom with a walk-in shower is also included. The owner lives in the nearby building. Guests are invited to enjoy a continental breakfast every morning. Restaurants can be found downtown which is a 3-minute walk away. This property is a 14-minute walk from Nevers Cathedral and a 20-minute walk from the Train Station. A former post house is located nearby, the A77 motorway is 5 km away and Golf de Magnicourt is 5 km away. Hotel Nevers Preferred hotel ! This hotel is located in Nevers, just a 5-minute walk from the town centre. All of the rooms at Nevers Hotel feature a flat-screen TV and a private bathroom with a a bath or a shower. Reversible air conditioning is provided. A continental breakfast is served every morning in the communal lounge. Free Wi-Fi is provided throughout the hotel. Free, closed parking is also possible on site and the Palais Ducal is just 1 km away. The train station is just 1 km away. In the very heart of Nevers, Hotel The Originals Nevers Clos Sainte Marie (ex Inter-Hotel) offers a patio, a garden with outdoor furniture and water cascades that create an aquatic atmosphere. Bicycle hire is available at this hotel and free fibre optic WiFi is available throughout the property. Accessed by stairs, all rooms are spacious and feature a flat-screen TV and a private bathroom with a bath or shower. Some rooms are located in an annex and offer a balcony or terrace. A buffet breakfast is served every morning at Hotel The Originals Nevers Clos Sainte Marie. Restaurants can be reached within walking distance. Situated only 5 minutes away from the pedestrian streets, this hotel is 1.6 km from Sainte-Bernadette Cathedral and 20 km from Magny-Cours Circuit. Le Cadran des Chauvelles is located in Nevers, a 15-minute walk from the city centre. This guest house features a garden with a furnished terrace and the bedroom is air-conditioned. It is on the edge of Saint-James’ Way and free Wi-Fi access is available. The family suite features a flat-screen TV and a seating area with a small refrigerator. It features a large bathroom with walk-in shower. A living room as well as a fitness room and a library is at guests' disposal. The breakfast provided every morning includes homemade cakes, cereals, fresh bread as well as dry and seasonal fruits. A courtesy tray is provided in the suite. The accommodation is situated 1.1 km from Ducal Palace of Nevers, 1.2 km from Nevers Cathedral and 1.3 km from Nevers Train Station. The property offers free parking. Situated in Nevers, 2.7 km from Ducal Palace of Nevers, Les altheas d'Isa offers a living room with a flat-screen TV, and a garden with a barbecue. Guests staying at this holiday home have access to free WiFi. This holiday home with garden views features 1 bedroom and 1 bathroom with a shower. The kitchen features a dishwasher, an oven and a microwave, as well as coffee machine. Guests at the holiday home can enjoy a buffet breakfast. The reception can offer helpful tips for getting around the area. Les altheas d'Isa offers a children's playground. If you would like to discover the area, fishing and hiking are possible in the surroundings. Nevers Cathedral is 2 km from the accommodation. Hotel Varennes Vauzelles Preferred hotel ! The Hotel Magdalena in Varennes Vauzelles, offers affordable accommodation with comfortable rooms and a range of facilities. Rooms are non-smoking and include big-screen TV, bathtub, renovated showers, and a balcony or terrace. Within the Hotel Magdalena there is a restaurant, a free billiard table, business centre and seminar room, and corner pub. A generous breakfast buffet is available each morning and features organic local products. Located in the centre of Nevers, the Kyriad Hotel offers comfortable, air-conditioned rooms with satellite TV and a work desk. You can sample traditional French cuisine in the hotel restaurant. Free private parking is provided at the Kyriad Hotel Nevers Centre, making it easy to explore the Bourgogne region by car. The Kyriad is situated just 200 metres from the Sainte Bernadette hunting grounds and 15 kilometres from the Nevers Magny motor racing circuit. The friendly and attentive staff at the Kyriad Hotel Nevers Centre will be happy to help you organise your stay in Nevers 24 hours a day. The Hôtel de Verdun is located at the heart of Nevers, opposite Roger Salengro Park and a 5-minute walk from the Cathedral and the town hall. It features a fitness room and a patio, where you can rent bicycles or store your own. All of the rooms are equipped with an en suite bathroom with bathtub or shower and hairdryer. Set in the patio, superior rooms have a heated towel rail. Free Wi-Fi access is provided throughout the hotel. The continental breakfast includes homemade cakes, homemade marmelade, cheese, ham and fresh orange juice. Pet owners will be pleased to find cats are welcome at this property. Free and available upon request, you can have a cat tree, water, food and bed for your beloved pet. The Nevers Train Station, the theatre and the Loire River Banks are a 10-minute walk from Hôtel de Verdun. Magny-Cours is a 20-minute drive away. It is also a 3-minute walk away from Espace Bernadette Soubirous. Free on-street parking can be found nearby. Located on the outskirts of Nevers, Logis Hôtel Astréa is a non-smoking hotel just 2 km from the city centre. It features a garden and offers modern guest rooms with free Wi-Fi access. A flat-screen TV with satellite channels is provided in each room. The private bathrooms are fitted with a shower and include amenities. Enjoy a buffet breakfast every morning while reading the newspapers provided at this hotel. Nevers Cathedral is located 2.5 km from the hotel and free private parking is available on site. Set on the banks of the Loire River, the Mercure Nevers Pont de Loire enjoys a privileged location opposite the city centre with easy access from the A77 motorway. The spacious and well-appointed rooms at this Mercure hotel are equipped with en suite facilities. Some offer a view of the Loire. The restaurant serves traditional French cuisine and in the summertime, meals can be served on a terrace overlooking the river. So, for your next stopover or short stay in this charming area, look no further than the Mercure Nevers Pont De Loire. The property has 2 private car parks and one of them is free. The hotel is situated just minutes from Nevers city centre, easily accessible from exit 33 on the A77 motorway and offers comfortable and affordable accommodation. Europe Hotel features 48 rooms with large beds and bunk beds, 2 rooms with easy access for the disabled (available upon request), connecting rooms for families, an all-you-can-eat buffet breakfast and private parking. All the rooms are equipped with en suite bathroom. Free Wi-Fi internet access and free public parking is available for all guests of the Europe Hotel. HotelF1 Nevers Nord offers accommodation in Varennes Vauzelles, a 12-minute drive from Nevers. HotelF1 Nevers Nord features free WiFi throughout the property. All rooms include a flat-screen TV and a shared bathroom. Guests can purchase microfibre towels at the hotel at an extra cost of EUR 3 each. Nevers is 2.4 km from hotelF1 Nevers Nord, while Magny-Cours Race Circuit is 28 km from the property. Situated in Nevers city centre, this hotel is just 750 metres from the train station and a 10-minute walk from the Loire River. The property provides free WiFi and a private terrace. Hôtel Villa Du Parc features guest rooms with LCD TV and a view of Salengro Park or the courtyard. A buffet breakfast is served every morning and an express breakfast is available to take away, which includes hot drink, a cold drink and a pastry. Picnic baskets are also available at a extra cost if you reserve in advance. It is opposite the park, 50 metres from the Sanctuary of Sainte Bernadette and a 20-minute drive from Circuit de Nevers Magny Cours. Bicycle parking is available on site. This Campanile hotel is located to the north of Nevers, a 10-minute drive from the town centre, in Burgundy. It offers free private parking and free Wi-Fi. Each guest room at the Campanile Nevers Nord – Varennes Vauzelles is air-conditioned and has cable TV and a private bathroom. The Campanile restaurant serves buffet-style meals, regional specialties, and a selection of organic meals. It also offers a meeting room with a projector, screen and free Wi-Fi. The Campanile Nevers Nord is easily accessible from the A77 motorway. Guests can visit the nearby Chasse St Bernadette and the Duke’s Palace, and the Magny Cours race circuit is 22 km away. Espace Bernadette Soubirous Nevers is located in the heart of Nevers. Set in a renovated convent, this traditional-style guest house features a 4-hectare park known to be the sanctuary of historic character Bernadette Soubirous, with terrace and a shared lounge with TV and magazines. With a garden view, the heated rooms are simply decorated. Some are en suite while others give access to a private shower. Free Wi-Fi access is available in some of the public areas. Guests can request a packed lunch or a set menu shared with other guest can be sampled on site. After lunch, you can visit the chapel on site or read a book from the library. Other facilities offered at the property include a gift shop and luggage storage. Meeting and banquet facilities are also available on site. The bed and breakfast is 600 metres from Ducal Palace of Nevers, 600 metres from Nevers Train Station and 700 metres from Nevers Cathedral. The property offers free parking. Chambres d'Hôtes Côté Parc-Côté Jardin is set in a 1930s building at the heart of Nevers, in the middle of a 2000 m² garden with outdoor furniture. It offers free WiFi access. The guest rooms at Côté Parc-Côté Jardin have a view of the garden or park. They include a flat-screen TV, and the private bathroom is fitted with a walk-in shower. A small fridge and an electric kettle are at guests' disposal in a shared area. Breakfast with bread and jam, homemade pastries, fruit salad, freshly-squeezed orange juice and crepes can be enjoyed every morning at Côté Parc-Côté Jardin, and many restaurants are found nearby. Parc Roger Salengro is just across the street from the B&B. A free and secured parking is available on site and Nevers Train Station is 500 metres away. Guests will also find a bike storage. The property is 100 metres from Sainte Bernadette Chapel, 700 metres from Nevers Cathedral and 650 metres from the Ducal Palace of Nevers. Hôtel Clèves is situated in the historic district of Nevers, just 300 metres from the Nevers Train Station. St Bernadette Reliquary is 1 km from this hotel which offers en suite guest rooms. Accessible by a staircase, the guest rooms at Hôtel de Clèves feature private bathrooms with a bathtub or shower. Each room includes a TV and telephone. A continental breakfast is served daily in the breakfast room. Evening meals are available upon request. Several cafes and restaurants are located nearby. If you bring your bike with you, a bike storage is at your disposal. The famous wine-producing town of Pouilly is 40 km from Hôtel de Clèves, Sancerre is 55 km away. The Best Western Hotel De Diane has been owned by the same family for 4 generations and offers modern comforts whilst retaining its original, period charm. This 18th-century house presents cosy accommodations blending classic architectural features with modern comfort and elegance. The breakfast room is set in the former Saint Laurent tower, which dates back to the 14th century, and breakfast is served daily in the charming décor of a vaulted room. Attentive staff will try their best to help you make the most of your stay and contribute to a comfortable home-from-home feeling. Situated in Nevers, near Ducal Palace of Nevers, Camping de Nevers features free WiFi, and guests can enjoy a terrace. The units have a fully equipped kitchenette with dining area, a microwave, coffee machine, and a fridge. The camping offers a children's playground. Guests can also relax in the shared lounge area. Nevers Cathedral is 1.1 km from Camping de Nevers. Located 400 metres from Ducal Palace of Nevers, Le jardin des remparts offers accommodation in Nevers. Porte du Croux is 190 metres from the property and Nevers Train Station is 400 metres away. The apartement features a living room with a flat-screen TV and a dining area. It also has a kitchen and a bathroom fitted with a shower. The property is 400 metres from Nevers Cathedral and 300 metres from Nevers Faïence Museum. Free private parking is featured and free WiFi is offered throughout the property. The garden provides direct access to the Loire River. Located in Nevers, within 1.4 km of Ducal Palace of Nevers, Le Train bleu is an accommodation offering city views. The accommodation is 700 metres from the Nevers Cathedral and has free WiFi. The apartment includes a kitchen with a microwave and a toaster, as well as a coffee machine. The apartment also provides a seating area, washing machine and 1 bathroom with a shower. Located in the centre of Nevers, Hôtel Thermidor offers luggage storage and a lounge area with both a TV and free Wi-Fi access. The train station is ideally located a 2-minute walk away. All rooms feature a flat-screen TV, a telephone, wardrobe and desk. The en suite bathroom is complete with a hairdryer. A continental breakfast is available each morning at Hôtel Thermidor. Guests can also find restaurants within walking distance. The Roger Salengro Park is 450 metres away and the Loire River is a 5-minute drive from the hotel. Public parking is possible at a location nearby and the hotel provides motorcycle and bicycle parking in the courtyard. Located beside the banks of the Loire River, this 3-star hotel with a 24-hour reception is 10 km from Magny Cours Race Track. Traditional dishes are served in the restaurant, which offers a shaded terrace. Free WiFi and satellite TV are provided in the air-conditioned rooms. Each modern room features parquet flooring, and the private bathrooms are fitted with a shower and hairdryer. A buffet breakfast composed of sweet and savoury dishes such as eggs, fruit salad, yogurts and juices is served every day. Pastries baked on site and fresh French Madeleine cakes are also on offer, as well as a hot beverage and a piece of fruit to take away. Outside of regular breakfast hours guests can also enjoy a lighter option, available from 04:00. You can enjoy a drink in the bar while reading the newspapers provided. Nevers Train Station is just 1 km from this hotel and free private parking is possible on site. You can visit Nevers Cathedral, located 900 metres away. Hotel The Originals Nevers Centre Gare is located opposite Nevers Train Station, in the heart of the city centre, just 15 km from the Magny Cours Formula 1 Circuit. It offers air-conditioned rooms with flat-screen TV with satellite channels and free WiFi access. Each room has a private bathroom with a hairdryer. Every morning, guests can enjoy a buffet breakfast while reading the free international newspapers provided. Hotel The Originals Nevers Centre Gare provides private parking. Saint-Cyr Cathedral, the Saint-Bernadette Sanctuaries and the Frédéric Blandin Museum are a 5-minute walk away. Opposite the Loire River, Résidence Suiteasy Nevers offers a self-catering studio with free internet access. The studio features a wardrobe, individual heating and the private bathroom is complete with a shower and toilet. The kitchenette includes a stove, microwave, refrigerator, and kitchenware is also provided. Restaurants and shops can be found in the centre of Nevers, just 700 metres away. A take-away breakfast is available at an extra cost and includes a hot drink, breakfast cookies and orange juice. Résidence Suiteasy Nevers is 900 metres from Nevers Train Station. Private parking is provided on site at an extra cost and is subject to availability. This Premiere Classe Hotel is located in Varennes Vauzelles, in the Bourgogne countryside. It offers air-conditioned rooms with a private bathroom, satellite TV and free Wi-Fi access. Guests of the Premiere Classe Nevers Varennes Vauzelles can enjoy a breakfast buffet, which is served daily. The hotel also provides vending machines and free newspapers. The Varennes Vauzelles Premiere Classe Hotel offers free private parking. It is easily accessible by the A77 motorway and a 15-minute drive from Nevers town centre. This low-cost hotel features air-conditioned accommodation with free Wi-Fi access. Located in the Burgundy region, it is near the Magny-Cours racing circuit. Guest rooms at this ibis Budget Nevers Varennes Vauzelles are soundproofed and equipped with a flat-screen TV with satellite channels. Each room has a private bathroom. A buffet breakfast is served every morning in the dining room. Snacks and light meals are available around the clock. With free private parking available on site, the ibis Budget Nevers Varennes Vauzelles is just a 7-minute drive to the city centre. The hotel is accessible via the A77 motorway. Situated in Varennes Vauzelles, La Roulotte de l'Albizia offers accommodation with a terrace and kitchenette. A microwave and fridge are also featured, as well as a coffee machine and a kettle. Nevers is 5 km from the camping, while Sainte-Marie is 38 km away. Bed and Breakfast Varennes Vauzelles Preferred hotel ! Located on a 5-hectare park in the Loire Valley, this 19th-century country house is 3.5 km from Nevers. It features an outdoor swimming pool the spacious rooms all offer views of the surroundings. The guest house has individually decorated rooms that have antique furniture and a flat-screen TV. With an extra cost, guests can enjoy the spa's sauna and hot tub. There is also a 17th-century chapel and free Wi-Fi is available in public areas. This hotel is situated between vineyards of Pouilly-sur-Loire, Sancerre and the Magny-Cours racecourse. Free parking is possible on site. This hotel is situated at exit 33 of the A77 motorway, just 3 km from the city centre of Nevers. It offers rooms overlooking the hotel’s terrace and French garden. The guest rooms at the Hotel La Croix De Vernuche are individually decorated and have period features. Each is equipped with free Wi-Fi access and a TV. Guests can request a continental breakfast every morning, in the dining room or on the garden terrace. La Croix De Vernuche also has a private bar. Situated in the village of Varennes-Vauzelles, the Vernuche is in close proximity to the Sancerre vineyards. Hotel La Croix provides free private parking. 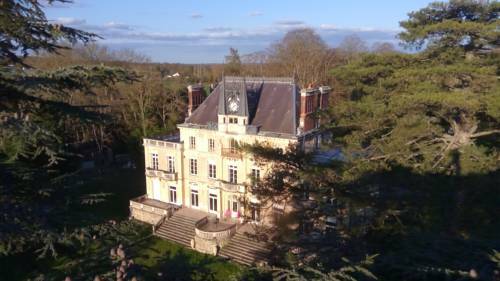 Set on a 3-hectare landscaped park, Chateau de la Rocherie Nevers Nord / Varennes-Vauzelles is a pet-friendly bed and breakfast situated in Varennes Vauzelles, 8 km from Nevers. Guests can enjoy the on-site restaurant and fitness centre. Free WiFi is available on site. All rooms are individually decorated and offers a flat-screen TV and free WiFi. Each room comes with a bathroom equipped with a bath or shower. Guest can enjoy a breakfast or a meal at the restaurant de la Rocherie at an extra cost. There is babysitting service at the property. The property also offers car hire. Pouilly-sur-Loire and is surrounding vineyards are 38 km from the property, while Sancerre is 43 km from Chateau de la Rocherie Nevers Nord / Varennes-Vauzelles. The property is a 1-minute drive from highway A77, providing access to Magny Cours race track within 25 minutes. Free private parking is available on site. Hotel Sermoise Preferred hotel ! Garden's Hotel is located south of Nevers and offers a warm and friendly welcome. The hotel and the rooms have been entirely redecorated in a harmonious and original style. For your comfort, the hotel features two-bedded and family rooms. Enjoy the peacefulness of the countryside in the large private garden featuring a tennis court. The hotel's restaurant, 'La Boucherie', is next door, and offers a menu specialising in the most flavourful meats of France. Guests can also cook in the hotel, a room with microwave and refrigerator is at their disposal. A supermarket can be found 200 metres away. Chambre d'hotes "Les Bordes" is located in Marzy, just 5 km from Saint-Cyr Cathedral in Nevers. The property offers a garden, terrace and shared TV lounge. Featuring a shower, private bathrooms also come with a hairdryer and towels. The room includes a wardrobe. A breakfast is provided each morning at Chambre d'hotes "Les Bordes". A choice of restaurants can be found in Nevers city centre. Guests can enjoy wine tasting in Pouilly-Fumé, a 30-minute drive away or Sancerre, 54 km from the property. Free private parking is possible on site. Situated in Garchizy, Domaine Des Rigaud has free bikes, outdoor swimming pool, garden, and free WiFi. Boasting a 24-hour front desk, this property also provides guests with a terrace. The restaurant serves Local dishes. At the guest house, every room comes with a wardrobe. With a private bathroom equipped with a shower and free toiletries, rooms at Domaine Des Rigaud also provide guests with pool view. A buffet breakfast is available daily at the property. Nevers is 9 km from the accommodation, while Sainte-Marie is 39 km away. Situated in Marzy in the Burgundy region, chambre et salon vidéo has a garden. This bed and breakfast offers a terrace. The bed and breakfast offers a children's playground. After a day of cycling or fishing, guests can relax in the shared lounge area. Nevers is 8 km from chambre et salon vidéo. Featuring free WiFi throughout the property, La Maison de ma Tante offers accommodation in Pougues-les-Eaux. Free private parking is available on site. Nevers is 8 km from La Maison de ma Tante, while Sainte-Marie is 25 km from the property. Bed and Breakfast Montigny-aux-Amognes Preferred hotel ! Maison d'Hotes "Le Crot Galop"
Boasting accommodation with a terrace, Maison d'Hotes "Le Crot Galop" is located in Pougues-les-Eaux. This holiday home offers barbecue facilities, a shared lounge as well as free WiFi. The holiday home includes 2 bedrooms and a kitchen with an oven and a coffee machine. A flat-screen TV is offered. The holiday home offers a sun terrace. If you would like to discover the area, cycling and hiking are possible in the surroundings. Nevers is 10 km from Maison d'Hotes "Le Crot Galop", while Sainte-Marie is 26 km from the property. Guest accommodation Challuy Preferred hotel ! Located 6 km from Magny-Cours auto and moto circuit and 8 km from the city of Nevers, La Petite Fermette is set in a former barn with a garden and a sun terrace. The property features a fireplace and parquet flooring in the guest rooms. The heated holiday home includes a TV with satellite channels and a private bathroom with bathtub and a hairdryer. Free Wi-Fi access is available. The kitchen on site provides an electric kettle, a toaster and a microwave. A dishwasher and barbecue facilities are also here, at your disposal. There is an organic market in Challuy. The property is situated 9 km from Apremont-sur-Allier Medieval Village and 60 km from the city of Bourges and its cathedral. Free private parking is possible at the property and shuttle service from Nevers Train Station is available at an extra cost. Located in Pougues-les-Eaux, Hotel The Originals des Sources Nevers Nord offers 3-star accommodation with a casino and a garden. The property features a terrace, as well as a bar. The property features a 24-hour front desk and free WiFi is available. At the hotel, each room has a desk. Complete with a private bathroom, all guest rooms at Hotel The Originals des Sources Nevers Nord are equipped with a flat-screen TV and air conditioning, and selected rooms also boast a seating area. Guest rooms feature a wardrobe. Guests at the accommodation can enjoy a buffet breakfast. Nevers is 10 km from Hotel The Originals des Sources Nevers Nord. Guest accommodation Gimouille Preferred hotel ! Set on a 200-hectare park, this residence offers wooden cottages just 12 km from Nevers Train Station and 13 km from Nevers Magny Cours Race Track. The property offers 1, 2 or 3-bedroom cottages. All of the fully furnished cottages have a living room, private bathrooms with separate toilets and equipped kitchen areas. Breakfast is served every morning at Le Domaine du Grand Bois and children can enjoy it at a reduced rate. The private terrace includes a BBQ. Le Grand Bois, La Résidence also invites guests to use the sauna and the outdoor swimming pool with solarium from July. There is a terrace offering panoramic views. The hotel has an adventure park with a zipwire (supplement), volleyball, basketball and bicycle rental are also available on site. Many other activities can be enjoyed including canoes, bouncy castles, playground, tennis court and mini-golf course. Set in a 4-hectare park between the Loire Valley and Burgundy, this renovated Renaissance château features an outdoor swimming pool. It just a 5-minute drive from Magny-Cours Racing Circuit and A77 Highway. The rooms are all decorated in a different style and some of them feature free Wi-Fi access. Both modern and antique furniture are provided in each one and they range from a Renaissance style to a 1950s style. A breakfast buffet with fresh, local and organic produce is provided every morning and the restaurant with an à la carte menu is open for groups of 10 to 200 people, upon prior reservation. Bikes are available to borrow from the 24-hour reception at Le Sallay, then you can admire the large surrounding park. There is also a lounge, where you can relax by the fire. Saincaize Train Station is 7 km from the hotel and private parking is free on site. Nevers is only 12 km from the property and an adventure tree climbing course is just a 5-minute drive away. Absolue Renaissance is located 12 km from Nevers near the Circuit de Nevers Magny-Cours. It offers en suite rooms, a restaurant and free parking. Free Wi-Fi is available throughout the hotel. Absolue Renaissance’s rooms are decorated in different styles. They are air-conditioned and equipped with a flat-screen TV with Canal+ and private bathroom with a spa bath. Absolue Renaissance’s restaurant serves traditional French cuisine that varies with the seasons. Guests can dine in one of the 2 dining rooms or on the terrace during nice weather. The hotel has a bar and lounge where guests can relax with a drink. Below here is the hotels map of Coulanges-lès-Nevers. Names and details of Coulanges-lès-Nevers hotels can be shown on the map clicking on the prices icons.